Mobile Suit Gundam SEED Destiny Wallpaper: CTI 2: Who's your Heroine? 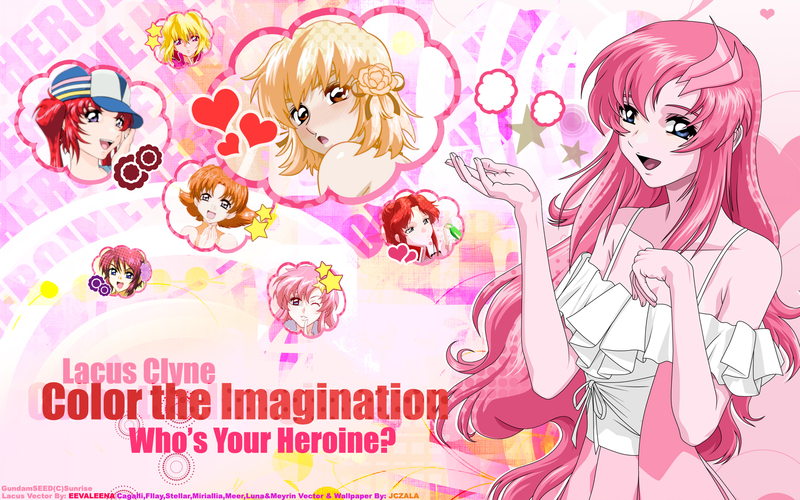 Minitokyo »	Mobile Suit Gundam SEED Destiny Wallpapers » Mobile Suit Gundam SEED Destiny Wallpaper: CTI 2: Who's your Heroine? This is the 2nd version of Color the Imagination, featuring the beautiful songstress of peace, Lacus Clyne from Mobile Suit Gundam SEED. After finishing the Bleach version, I wanted to make more. My mind's been "Colorful" lately. I was thinking of pink, I was thinking of cute, I was thinking of something random and literally appealing. So then I said..."I'm gonna make me a GS wallie with the gals in it." Okay, I used to not like Lacus before (Well, I liked her in SEED but not in Destiny), but she was just perfect for this wallpaper, even though Cagalli-sama is my most favorite character here. I ask Lacus the question: "Who's your heroine?" Being a heorine herself, Lacus best answer would obviously be Cagalli-sama. One thing, they're pretty close and Cagalli's the sister of her lover. Besides, both girls have endearing qualities and good leadership skills. They get along so well. Lacus has seen Cagalli's skills and strength in mind. The Lacus Vector, by the way, was done by Eevaleena@minitokyo.net and the rest is done by me. The colors and randomness really go well together. There's so much life and cheerfulness in this wallpaper. And the typography is perfect. You did well with this.